Not only does sustainable tourism reward your heart with a feeling of being part and parcel of such a beautiful natural world, but it also ensures that future generations too will have the chance to experience the same. To paraphrase an African saying, we must take care of the earth not because it was given to us by our parents, but because it belongs to our children. The many years I worked in different capacities for various tourism based establishment provided me with the much-needed hands-on experience required to participate positively in the industry in Africa. Apart from being sensitized to the needs of our very fragile environment that is the life and blood of tourism in this part of the world, I also came to understand what it takes to satisfy the needs of each and every visitor. When in 1984 I started Visit Africa Limited, my goal was to establish a firm that shied away from “mass tourism” dedicating itself to providing customized and personalized service to the visitor. This begins with the language our guides use on safari. For example, if you are French, we will get you a French speaking guide. We do the same for Spanish, Italian and English –speaking visitors. John de Souza was an indefatigable soul who, like Martin Luther King, harboured a dream. 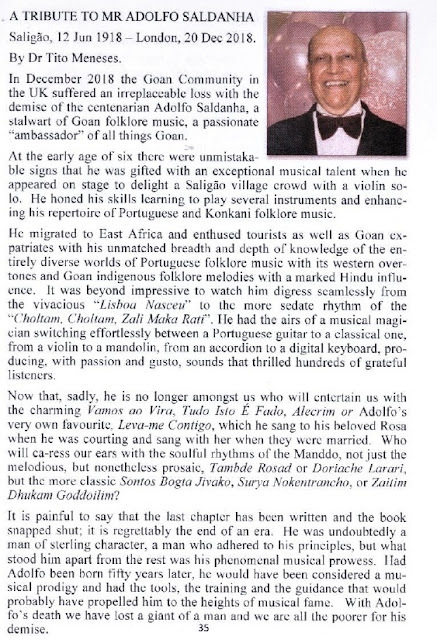 He was a Goan icon. He was a man of many talents. He was passionate about everything to do with the community – the Goan archives, his alma mater Dr Ribeiro’s Goan School and the local clubs. He was a historian and had the pulse of the nation at his fingertips. Ask him a question and within 24 hours you could be assured of an answer. Always willing to help on the condition he was kept in the background. He shunned being in the limelight. John had his finger in every pie and many wondered where he got the energy to keep on motoring day in and out after making that long trek to work from his home in Brampton to the Pickering Nuclear Plant a distance of some 70 k/ms each way. He would get home, freshen up and then give a few ladies a ride to bingos or any function being held that evening. That was John, always willing to lend a hand. His younger brother Romeo discovered John had passed away overnight on March 20 after a few phone calls went unanswered. The family usually met on March 19 to celebrate St. Joseph’s Day – the patron saint of Dr Ribeiro’s – and also to remember the day their father had died. This man with an encyclopedic mind saw his journey end at the age of 79 way too early since he had so many irons in the fire that needed urgent attention - primarily getting the different Goan organizations in Toronto together under one umbrella. He was rebuffed on several occasions but John wasn’t one to throw in the towel. He trudged on but his body obviously couldn’t pull him over the line. He will be remembered fondly for being the driving force behind several initiatives including the formation of the 55 Plus Goan Association, an organization in the west end of the Greater Toronto Association with a membership of 840. The 55 Plus was formed after the West End Seniors could no longer accept any more members. He was also the heart and soul of the Active Goans Club at Mississauga’s Square One. John, of course, will always be remembered for single-handedly running the popular Goan Voice Canada website that featured local clubs and more importantly death notices. After several years John was forced to bring down the shutters on his favourite venture much to the chagrin of the community at large after Romeo had asked him if he had a succession plan. For the first time, John admitted defeat but he still had so much on his plate to keep him going. With help from Goans across Canada he promoted the Konkani Rosary in video and was a founding member of the Friends of Goan Welfare Society along with Jerry Lobo, Teresa Mandricks and myself to raise funds for needy Goans in Kenya. We intend to close the account in the coming weeks with a final donation in memory of John. John and I had a long relationship. We worked closely on three Dr Ribeiro Goan School Ex-Students, Canada, functions. John also kept in close contact with Merwin de Souza, another ex-student, who lives in Florida and, like John, spends countless hours keeping the extremely popular Goan School website alive. John and I also worked on the Railway Goan Institute 100th anniversary celebration committee held in Mississauga on Sept. 20, 2009, and as co-editors put out a comprehensive 46-page glossy brochure. Of course, this piece wouldn’t be complete without a word from Merwin. “John was a history buff, particularly our Goan history,’’ wrote Merwin. “He had an obsession for details, most of us would miss. Recently he was obsessed with the old G.I. Duke St. building which was one of the few stone structures built in 1905 or so. “Why stone? Do you know how much-corrugated iron roofing cost at the time . . . the sheer cost?. . . . Why such a permanent structure when many of our pioneers at the time only had temporary permits?” He'd question. Like I knew the answer?! He was fascinated by a seminal 1955 Golden Jubilee G.I. brochure my dad published which to this day is often quoted in lieu of any other community records. Interestingly, among his many other roles, he also assumed the responsibility of community historian placing on record, in the many brochures he produced, the journey of our generation. His concern for the community was widespread from archiving a record of our contributions on this planet to raising the question should we as a community be concerned that our men and women of the cloth are being well looked after in their retirement. Like Martin Luther King, John’s dream of unity in the Goan community remains just that . . . . a dream. Farewell, buddy, I will miss our weekly chats and I wish all those boxes filled to the brim containing prized newspaper cuttings will find a new home.